Фото "cyclist? cavalier? you can never tell!" cyclist? cavalier? you can never tell! excellent moment, Jacob!! very well seen and taken! Excellent capture ,very well Jacob !! Very beautiful and well done. My congratulations, Jacob Lopes. The image gives a feel for the place. The vibrant colors are rich and inviting. I think he is both, anb your work is excellent. This is a very good catch that you didn`t miss. Remarkable colours. Congratulations Jacob. What beautifully work! 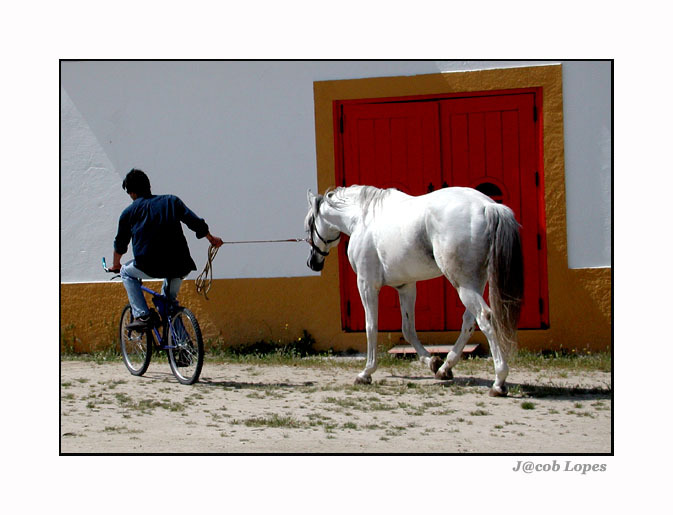 You caught your subjects in such a wonderful spot...the white horse against the red doors, the cyclist against the white. Perfect!! WOW!! !